Giselle and Julia place 3rd overall in the Young Event Horse Challenge. The beautiful Giselle, by Argentille Gullit, was a mare Julia established a wonderful relationship with, while they were both quite young. Their first big outing was to the one-day event at Kibah in 2002, where Giselle was entered in the Futurity. The mare easily won that competitive class on her dressage score (72.4%), and never looked back from there. 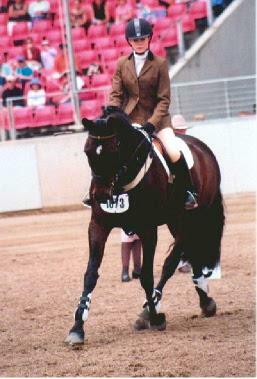 Julia entered Giselle in the inaugural Young Event Horse Challenge at Sydney Royal in 2003. The pair went up against a daunting array of professional eventers, and wound up in 3rd place overall, despite having had a spooky stop in the showjumping phase. Quite an achievement.